The Embr Wave is a "personal thermostat" — a wearable you strap onto your wrist to help you feel more comfortable indoors. Embr Labs says after three minutes of using the device, you can feel up to five degrees warmer or cooler. I tried the Embr Wave for a few days, and found that it helped me feel more comfortable when I was overheated, or shivering in a frigid office. Working in an office these days is an exercise in personal temperature control. One minute, you're sweating it out after your commute on public transit, or even just the walk into your office. The next minute, you're shivering in the arctic temperatures dictated by the thermostat. 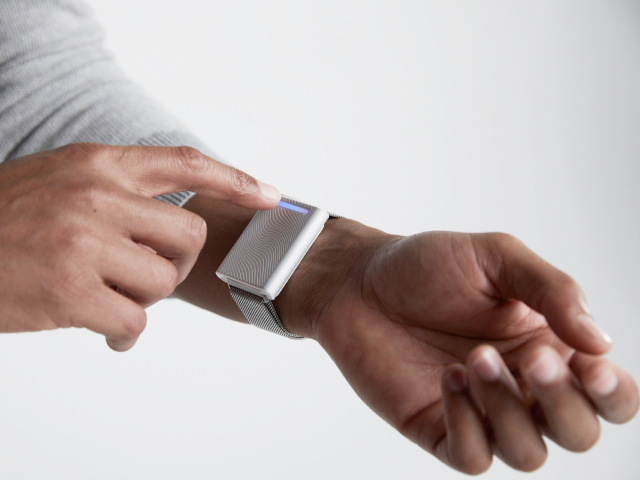 That struggle is what inspired the team at Embr Labs to create the Embr Wave, a "personal thermostat" you wear on your wrist. The Embr Wave works by heating or cooling on its own, depending on your needs. 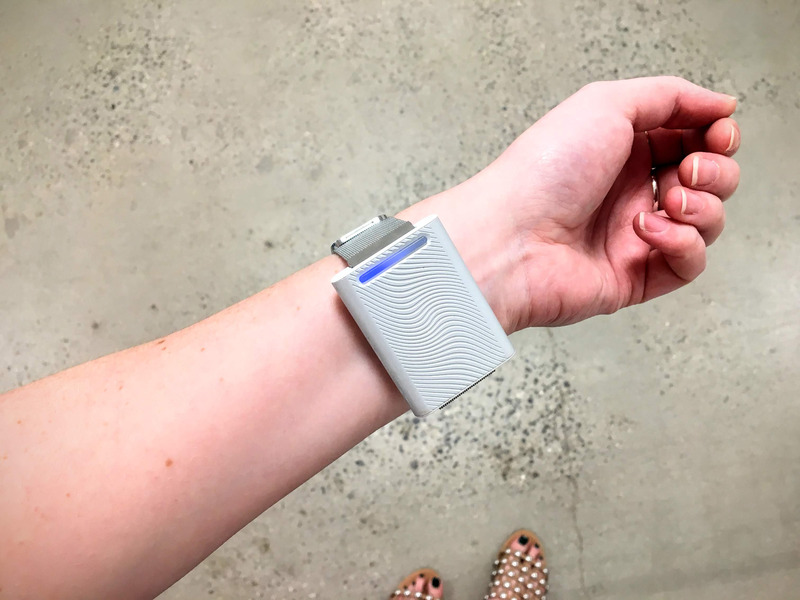 The idea is that, with the press of a button, you can feel more comfortable in your environment — in fact, Embr Labs says after three minutes of using the device, you can feel up to five degrees warmer or cooler. "Temperature is as much subjective as it is objective," Sam Shames, CEO of Embr Labs, told Business Insider. "Heating a building is like setting the temperature of a shower for hundreds of people." It all comes down to skin temperature. When you're feeling cold, your core body temperature doesn't actually change, but your skin temperature does, Shames said. Putting something warm against your skin will provide some relief and make you feel more comfortable in your environment. The idea behind the Embr Wave originated in a lab at the Massachusetts Institute of Technology in 2013. Shames — along with his cofounders, Matthew Smith and David Cohen-Tanugi — were so cold while working in the lab, they were bundled up in sweatshirts in the middle of the summer. They came up with the idea for Embr Wave and submitted to the Intel Make it Wearable competition that October. From there, their story blew up. "We started getting emails from people all over the world who said that temperature was the biggest problem in their lives," Shames said. By 2017, Embr Labs had launched a successful Kickstarter campaign, raising $630,000 — more than six times its $100,000 goal. The company also attracted investors like Intel and Bose. The Embr Wave officially went on sale in March, and it doesn't come cheap — it costs a whopping $300, nearly as much as an Apple Watch Series 3. The Embr Wave is intended for a group of people Shames refers to as the "thermally underserved population" — people who are frequently uncomfortable in their indoor surroundings, either because it's too hot or too cold. I happen to be part of that population — I'm almost always way too hot — so I tried out the Embr Wave for a few days to see if it made a difference. One of the best features of the Embr Wave is that the temperature sensation comes in waves. When you first put it on, just press the thin light bar on the front of the device, then press and hold on either the left or right side of the button — left for cold, warm for hot. From there, you'll feel a warming or cooling sensation intermittently for either five minutes or three minutes respectively. If you're not satisfied by the end of a session, just knock on the front of the device and it will restart. The only downside of that design is that if you accidentally set the temperature too hot or too cold, you have to wait for it to be done and try again. Shames recommends that you take the Embr Wave on and off as you need it. You don't have to wear it like a standard wearable — instead, just strap it on when you feel uncomfortable. This is a good thing, too, because the device is decidedly ... huge. It's nice looking, thanks to its metal mesh band and almost complete lack of buttons, but it certainly isn't subtle. In fact, I often felt like I was wearing a house arrest monitor on my wrist. Looks don't really matter, though, because the Embr Wave actually works. I tested it everywhere I could — at my apartment, on the subway, in the office, while walking from the subway to the office, etc. — and truly felt a difference in how comfortable I was. The Embr Wave certainly isn't a cure-all. In one situation where I was actively sweating on a too-hot subway car, it could only help me so much. But most of the time, it provided me with a pleasant cooling sensation that saved me from feeling warm and irritable. Of course, the same feeling could probably be achieved by running your wrists under cold water, but the Embr Wave can be hidden under a shirt sleeve and worn while you continue to work or sit in a meeting. So, do you really need a $300 wearable with only one function? Probably not. But if you're among the thermally underserved, you might want one.